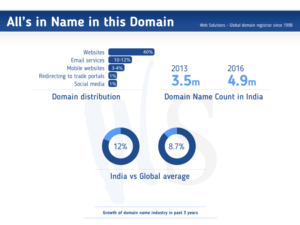 In the past three years, the domain name business in India has increased by 12 percent, outdoing significantly the global average of 8.7 percent, according to a study conducted by Zinnov, a research company. A majority of Indian small and medium businesses (SMBs), 79 percent, have a distinct preference for the .COM domain, similar to the Chinese market. The Indian country code .IN, popularized by the government, is used by relatively modest 46 percent of businesses. Approximately 25% of SMBs have adopted both .COM and .IN for the operation of their websites, the study shows. The reason why entrepreneurs prefer .COM over .IN is obvious: it is about prestige and brand perception and recognition on the Indian and global market. With the increasing digitalization, Indian businesses, particularly those providing services to foreign entities, have made steps to meet the professional standards adopted in the West. Using own company’s email IDs, as opposed to Gmail or Yahoo, creates a more professional image of the business. Furthermore, an effective use of domain names can positively impact the company’s revenues, according to the study. Having their own Internet domain helps companies better control the development of their business, conduct marketing activities as well as transactions more efficiently. The number of domain names in India has increased from 3.5 million in 2013 to 4.9 million in June 2016. The growth potential is enormous as only 1.1 out of 100 Internet users have a registered domain name. In the US, for that matter, the domain penetration ratio is 43.6 percent. Additionally, only 40 per cent of the 4.9 million registered domain names are used for websites whereas 10 to 12 percent of domains are dedicated exclusively to professional email services. Mobile-enabled websites constitute 3-4 percent, and less than 1 percent is used for redirecting to social media sites and commercial portals, the report shows. Geographically, the domain name registrations correspond to the economic potential of Indian states: the south has adopted 33 percent of domain names, the north 31 percent, west India 29 percent, and the east only 7 percent. 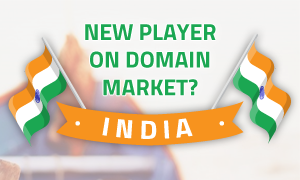 If the domain name industry continues to grow, India may soon become a valuable player on the market. If you are interested in establishing or increasing your online presence in India, please consider registering an Internet address within the .COM or .IN domain. You can use our search tool to check if the name you are looking for is available for registration.